CUPRA Ateca Special Edition on the way – here comes the bling! 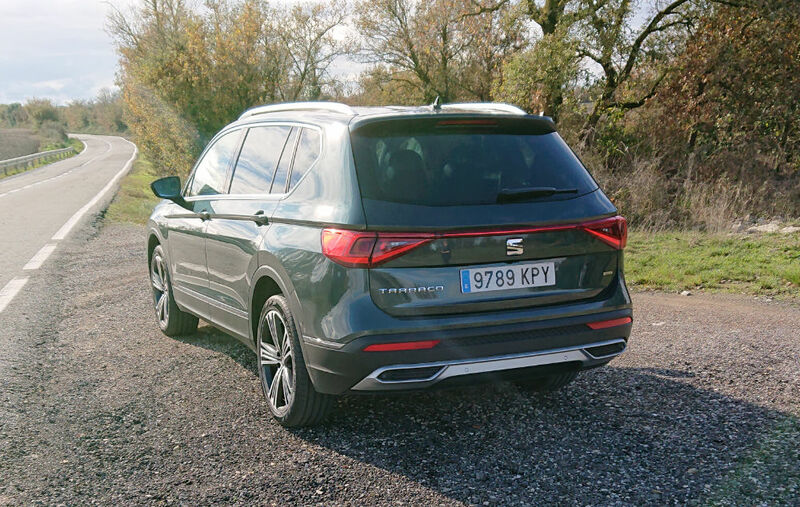 Join us for our first road test review of SEAT’s new 7 Seater Tarraco. Thanks to one of our moderators paddy6789 for the review. Once we powered our way through the passport control at Barcelona airport, we were paired up and given an option of model lines to pick from and drive to our meeting point 80km away in Ca n’Alzina. 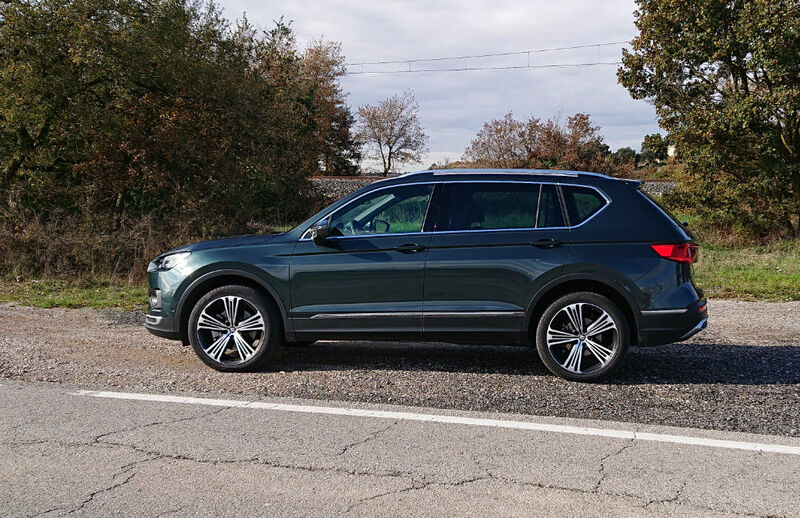 The model of our choosing initially was the 7 Seater 2.0 TSI 190 PS 7 Speed DSG 4 DRIVE Xcellence. As we were walked to our chosen car, there was no mistaking where the Tarraco was parked. There it stood in Oryx White with 20” alloys, looking proud at over 1.6m high and 4.7m long – the car certainly demands presence, and it achieves this no matter what angle you look at the car from. The key feature for us was the front end; the arcs within the bonnet and the flat nose giving the car an aggressive look and stance. 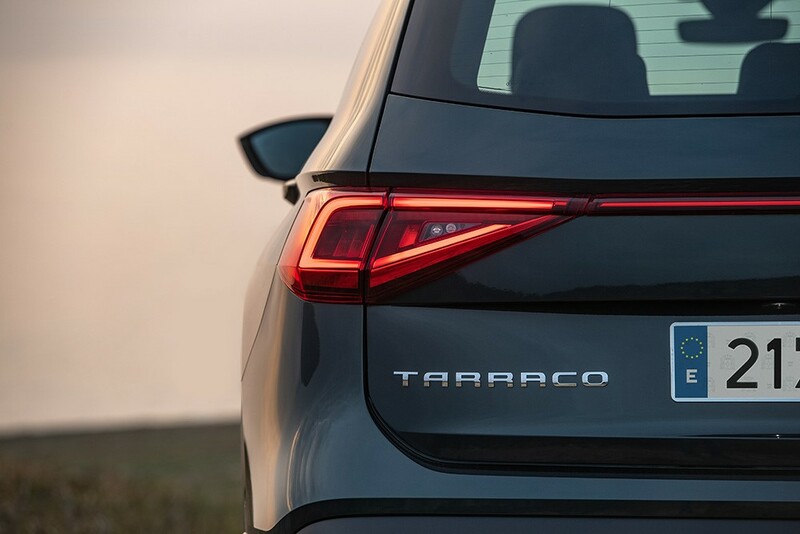 Our first insight into the new technology enhancements that the Tarraco brings was the electric tailgate, once we had finished loading our luggage into the 700l boot! A simple press of the button on the tailgate and the car takes care of the rest. This is accompanied with a button on the driver’s door to open the tailgate automatically too. For the more ‘old fashioned’ drivers, the tailgate is also equipped with a standard release button under the rear badge, and you can close the tailgate with minimal effort manually. For the first half of the journey to Ca n’Alzina, I was the passenger which gave me the opportunity to look around the car and get a feel for the interior. With full leather seats, new wood effect trim along the doors and dash, and the small ‘Beats’ logos on the speakers, it was clear that some time had been spent on making the interior look spacious and modern. 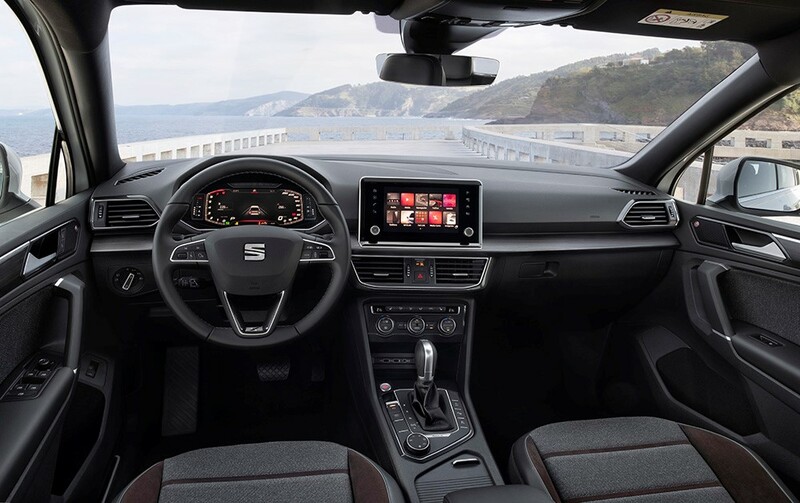 The standout feature is by far the new ‘floating’ 8-inch screen in the centre of the dash which boasts the new ‘gesture control’ feature – Simply move your hand left or right to change screen or radio station. This tied in with the new digital cockpit, just provides a clutter-free, yet information-rich dash for the driver. The driver seat was equipped with full electrics allowing the driver to adjust the seat effortlessly, and then save the settings within memory banks. The front passenger seat, however, has to make do with the more traditional levers to adjust the seat. Our next insight into more of the new technology came as we were driving on the motorway. The blind spot sensors and the lane assist work seamlessly together. If you try to change lane without indicating or if the blind spot hazard light is illuminated, prepare to wrestle with the car as it almost refuses to let you steer and keeps you within the current lane. This is a very handy feature, especially as the car is over 2.1m wide. At the halfway point of the drive to Ca n’Alzina, we pulled over on a small country road so that I could take over the drive, but we took a minute to walk around the car and look and what else it had to offer. The centre console is loaded with buttons, and of course, we pressed them all! These enabled features such as automatic assisted parking, parking cameras and dynamic chassis control (DCC). We were hugely amazed by the parking cameras that give not just front and rear views, but a full 360-degree view of the car. 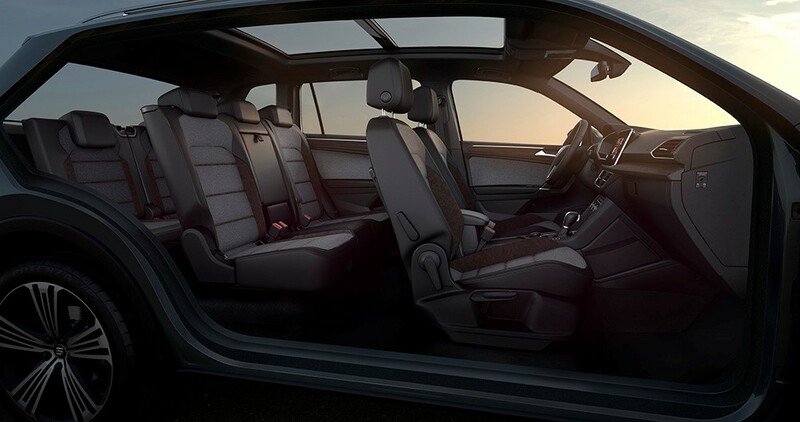 From here you can switch to a birds-eye view of the car, with the terrain clearly visible all around the car. You can even adjust the viewing angle of the car to get the view you really need to see what is around you. For my stint of the drive, I was lucky enough to have more of the twisting hill roads, and I could really test how the car handled. Despite the car being over 2.1m wide, it was really agile and with the help of the active DCC, I could put the power down when needed on the hills. The progressive steering was very light and responsive and the ride was very smooth – I must’ve hit half a dozen potholes but didn’t really feel a thing. The 2.0 petrol engine was very quiet, even higher up in the rev range, and the gear changes were very slick, with no jolting or juddering. As the road flattened out, the surface changed from dirt to tarmac, and the corners became straights, I turned the DCC into sport mode. This was to test how the car reacts to sudden bursts of acceleration down the straights, and out of corners. The steering stiffened up, and the car certainly rolled less in the corners. 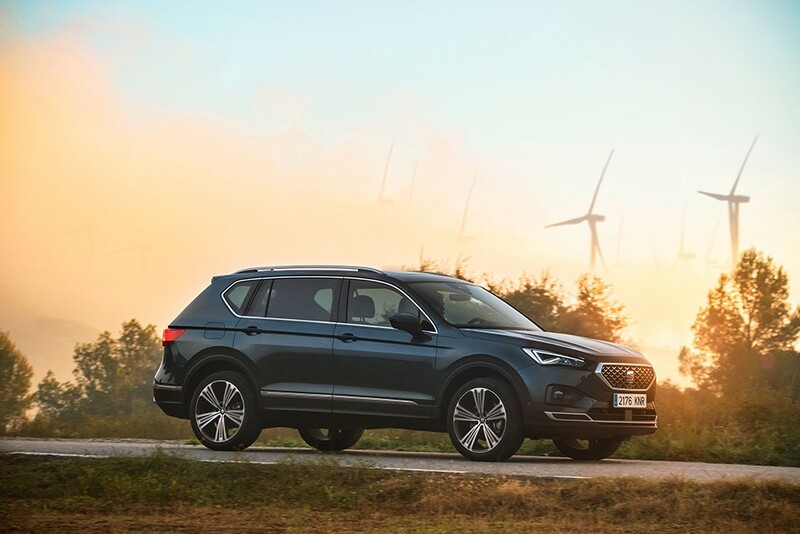 The Tarraco was definitely no slouch with the 2.0 190 PS petrol engine getting you from 0-60 in 8 seconds and giving you 320nm of torque. However, it felt like the car could’ve changed gear a bit sooner on some of the upshifts, and the gear changes themselves weren’t as smooth as you would like. The car did pull nicely and there is definitely enough power at your disposal to make the car feel sporty and responsive. The tarmac ran out, and we soon found ourselves back on steep, narrow roads, with the car switched back into ‘Normal’ DCC mode which enables the active DCC. Climbing the hills, and turning the sharp corners were not an issue at all. We tested the auto hold feature on these hills. Although it’s not a new technology for SEAT, we felt it should be tested anyway. Pressing the brake pedal firmly and releasing it once the green light appears enables the assisted brake, and it will hold the car until you accelerate away. The car does not roll back and the active DCC smartly controls the power and suspension to give you the smoothest and most efficient launch. Once we had reached our destination, we were greeted by our next Tarraco. This one was the diesel equivalent of the petrol one we had just driven. A dark camouflage 7 seater 2.0 TDI 190 PS 7 Speed DSG 4 Drive Xcellence. With identical power and 0-60 figures as the petrol engine, this diesel had more torque at 400nm. We wanted to give this car a similar test to the petrol, and so our Sat Nav was programmed to do a 54km loop that combined dirt tracks, normal A roads and motorways around Ca n’Alzina. Again, for the first half I was the passenger and could look around the interior and the first thing I noticed was the panoramic sunroof, which the previous car didn’t have. A quick press of the button above the rearview mirror, and the sky is revealed and barrels of light flooded into the car. The interior feels very spacious anyway, but with the additional light, it felt a lot bigger. There was only one other change to the interior from the petrol car, and it was the seats. These seats were fabric and alcantara, and I must admit that I preferred them over the leather, mainly due to the fabric providing more of a lighter appearance over the black leather. The engine itself, being a diesel was naturally a lot louder than the petrol, and the gearing didn’t feel as smooth as the petrol. That being said, the additional torque was noticeable on the hills and the active DCC really benefited from it. Setting the car into sport mode didn’t really have much effect on the diesel other than revving higher, which I still think wasn’t necessary as it generated more noise than power really. Out of the two cars we drove, our preference had to be the petrol engine. Although we didn’t get to test the 1.5 TSI 150PS engine, a lot of the people we spoke to said that this engine was a huge surprise and felt very similar to the 2.0 TSI 190PS engine. SEAT believe that the 1.5 engine is most likely going to be the preferred choice by the UK buyers. 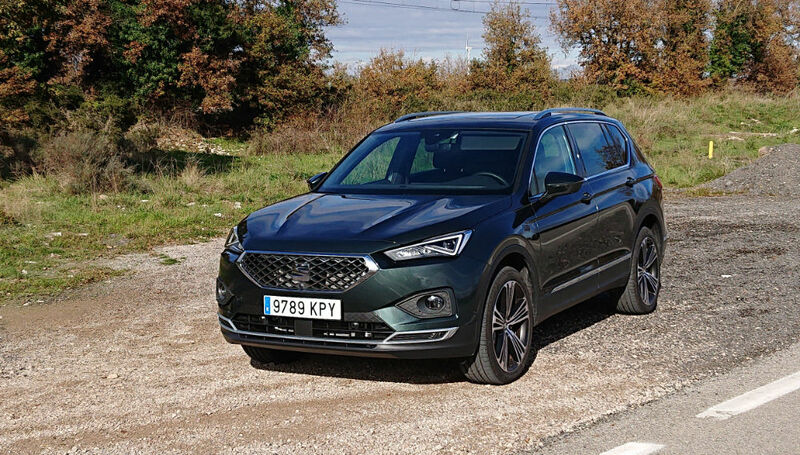 The Tarraco divided a few people on the styling, however, it is clear to see what SEAT’s intentions are for the future and how the new cars will be moulded. Ordering should be available mid/late December 2018 with the first deliveries being around March 2019. 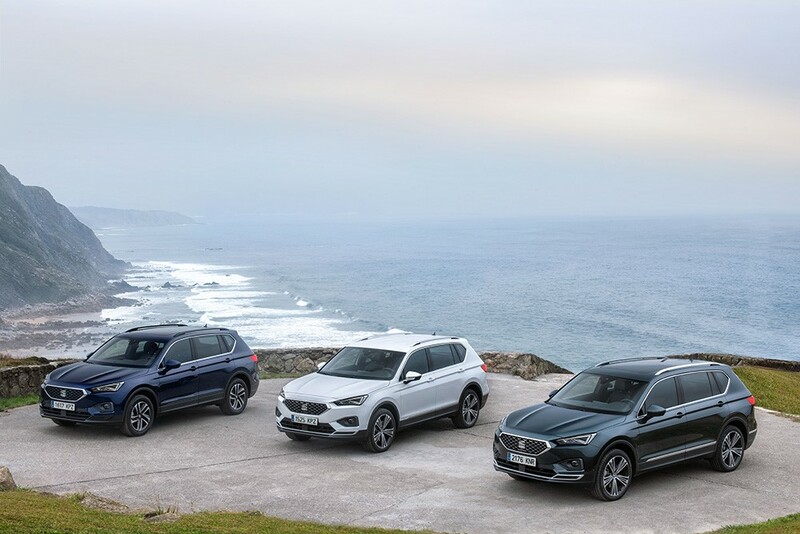 There are a couple of caveats around the Tarraco and the UK spec – you can only order a 7 seater, and unfortunately, the active DCC isn’t available in the UK, which is a shame as we felt this was the best feature on the car. The new Traffic Jam assist will be a nice feature however, as this works when the ACC (adaptive cruise control) is enabled, and can slow down for traffic jams, and can perform the slow creeping forward. The car is being launched with two trim lines; Style (SE) and Xcellence. There will be an FR trim released further into 2019 and a hybrid plug-in version also released into 2020. 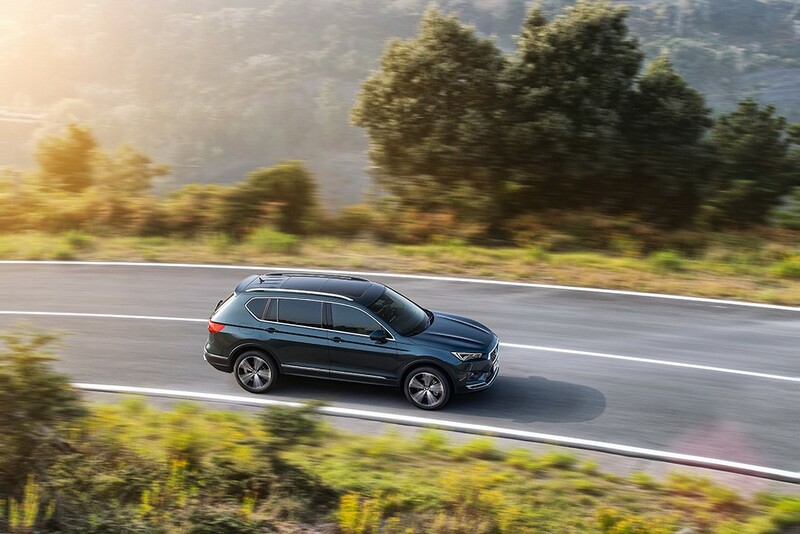 The SEAT easymove scheme means that there are very few options to select when ordering the car, as the trim levels have a pre-set specification. There are eight colours to choose from; Dark Camouflage, Oryx White, Reflex Silver, Atlantic Blue, Indium Grey, Titanium Beige, Deep Black and Urano Grey. 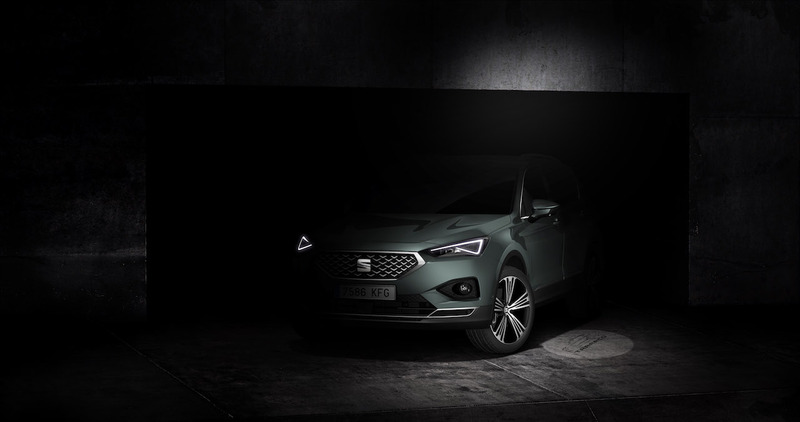 We did ask if Cupra would be getting their hands on the Tarraco, but the answer was that there are no plans for that to happen so soon into the launch, but the groundwork is always there so it is a possibility. SEAT’s next project, the Leon MK4!